This is a beginners’ guide to action research, though experienced action researchers may find it useful too. It is written in reader-friendly, accessible language, with lots of examples and exercises. 2 Why do action research? 3 Who can do action research? 4 What is involved in doing action research? 5 How is action research different from traditional research? PART 2 - WHY SHOULD I DO ACTION RESEARCH? 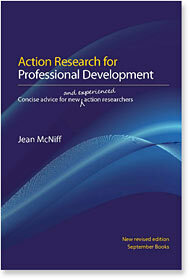 8 How can action research help me as a practitioner? 10 Where is action research located in research methodologies? 11 What if I am unemployed? Can action research help me then? PART 3 - HOW DO I DO ACTION RESEARCH? 12 How do I do action research? 13 How do I begin an action enquiry? What is my concern? 15 Why am I concerned? 16 How do I show the situation as it is and as it develops? 17 What can I do about it? What will I do? 18 How do I generate evidence from the data? 19 How do I check that any conclusions I come to are reasonably fair and accurate? 20 How do I explain the significance of my research? 21 How do I modify my ideas and practices in light of my evaluation? PART 4 - WHAT IS THE SIGNIFICANCE OF MY ACTION RESEARCH? WHAT ARE THE POSSIBLE IMPLICATIONS?